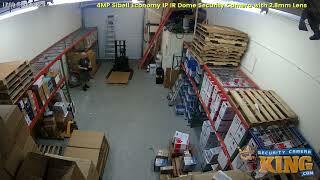 We’ve brought in an economically priced dome security camera to add to our great lineup of products within our Sibell series. This 4MP vandal dome is great all around camera that can be used in so many different places and with the 2.8mm fixed lens, you’ll get one of the widest angle views available! If you ever need to zoom in on a recorded footage, you can be confident that the 4MP resolution will let you do that without distortion. The IP66 weather rating means that this camera can be used in both indoors and out! We know that sometimes placement of your cameras can be difficult due to poor lighting situations. Not a big deal with this camera since it has built-in IR (infrared) that allows you to see up to 65 feet in total darkness. Imagine what you’ll see lurking in the darkness! If you already have CAT5/6 network cable running through your building, you can take advantage of that and use that same cable to power these cameras thanks to PoE (Power over Ethernet). You’ll see an instant cost savings right there because you won’t need to run a power cable alongside that network cable. Remember that if you prefer, you can always use a standard 12V DC power supply. 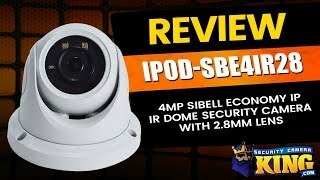 Purchase this Sibell product with confidence thanks to the 2 year warranty, FREE US based support as well as FREE remote viewing software!